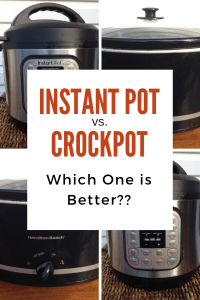 Which one is better: Instant Pot or Crock-Pot? 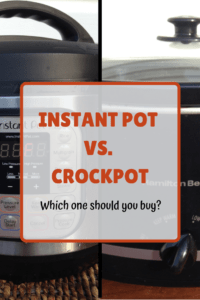 What’s the difference between an Instant Pot and a Crock Pot? Which one has more functions? How long does it take to cook dishes in each? Which one makes the most varied types of dishes? 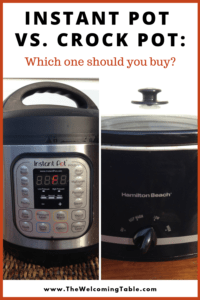 Which is best for me: The Instant Pot or the Crock Pot? Which model of the Instant Pot should I buy? Which model of the Crock Pot should I buy? 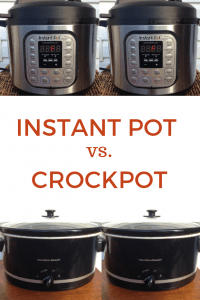 Instant Pot Vs. Crock-pot: Which One is Best? People in the U.S. have loved their Crock-Pots since they became popular in the 1970s. And for good reason. Who doesn’t love throwing in a bunch of ingredients, turning on the Crock-Pot, leaving the house, and coming back to a fully-cooked meal 6 hours later? But in the last few years, Instant Pots have burst onto the scene and have gained an obsessive, loyal following. If you know someone who owns one, you may even be tired of hearing about it. But you might also have some questions. Should I buy an Instant Pot if I already have a Crock Pot? What can an Instant Pot do that a Crock Pot can’t do anyway? 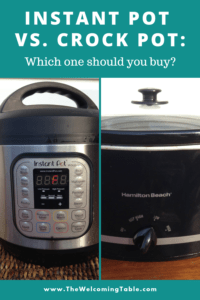 Today I’m going to compare the Instant Pot with the Crock Pot so you can decide which one works best for you and which one you should buy. BUY AN INSTANT POT NOW! BUY A CROCK POT NOW! I’ve owned a slow cooker for at least 15 years, and I received an Instant Pot for Christmas 2018. I’ve cooked extensively with each one, and there are things I love about both of them. I’ve used each of them for feeding my family and for hosting large groups. Let’s get the names out of the way first. Instant Pot and Crock-Pot are both brand names. In generic terms, an Instant Pot is an electric pressure cooker, and a Crock-Pot is a slow cooker. The brand of slow cooker that I currently own is a Hamilton Beach, but for simplicity’s sake, I’ll call it a Crock Pot. Pressure cookers are electric pots whose lids create a super tight seal, trapping steam inside and cooking food quickly (up to 70% faster than other methods!). According to the Crock-pot website, a slow cooker is an”electric pot with [a] stoneware insert…designed to operate completely on [its] own.” Crock-Pots cook food slowly, over a period of 4-10 hours by trapping heat inside. There is definitely a learning curve when it comes to using an Instant Pot. You have to learn about safety, cooking times, and its different settings. The first few recipes you try may feel like trial and error. But once you’ve made 2-3 meals in it, you get the hang of it. The Crock Pot is definitely easier when it comes to no-fail cooking. Like I said earlier, there’s nothing easier than throwing a bunch of ingredients in your slow cooker and going about your day. If you can read a recipe, you’re good to go. I have only used mine for pressure cooking, sauteing, and warming. I actually forgot that it can steam until I was writing this post — I’ll have to try it soon! I use the Saute function all the time to brown meat before cooking a dish or to saute onions & peppers before adding other ingredients. It’s so nice to be able to do all of that in one pot. I’ve heard people rave about using the Rice Cooker and Yogurt Maker settings, but I’ve heard mixed reviews about the Slow Cooker setting. You’re better off using the Pressure Cooker setting for anything that you’d typically cook in a slow cooker. A Crock Pot can be used for one thing and one thing only: slow cooking. But it’s really, really good at it. The Instant Pot prides itself on cooking things faster than many other methods of cooking. If, at 4:00 PM, you frequently find yourself panicking because you don’t know what to cook for dinner, the Instant Pot will cook it up fast — even if it’s frozen. That’s a huge benefit for those of us who aren’t always on top of things enough to set meat out to thaw the night before. Sometimes, though, the cooking times on Instant Pot recipes can be deceiving. For each recipe, you have to figure in not only cooking time but also the time it takes to come up to pressure and the time it takes to release the pressure. It definitely takes less time to cook dishes in an Instant Pot than a Crock Pot, but it doesn’t always take less time to use your Instant Pot than your stove, for example. Most meals in the Crock Pot take 4-8 hours. Some meals, though, you don’t want to cook for too long or they will overcook (like chicken) so if you work 9-5, you have to be careful to pick recipes that are a little flexible on time (like roast or soup). When it comes to the Instant Pot, the better question may be, What can’t you make in an Instant Pot? Frozen meat: You can actually put in frozen chicken breasts and they will cook be ready to eat in 30 minutes or so. Mac N’ Cheese: I had never been successful making homemade macaroni and cheese until I tried it in the Instant Pot. Oh. my. goodness. Game changer. Spaghetti: You can cook the pastaand the sauce together in one pot. So easy! Beans: This is one of my favorite things about cooking in the Instant Pot. You can cook dried beans without soaking them, and they will be done in a little over an hour. Soups/Stews: They only have to cook for 15 minutes once they reach pressure. Cheesecake: Yes, cheesecake! And it’s so easy and so good. You can cook many of the same things in the Crock Pot: beans, soups & stews, roasts & shredded meat. But you can’t make consistently good pasta or rice like you can in the Instant Pot, and it’s not recommended to put in frozen meat since you’re cooking at such low heat. The stainless steel pot is removable and dishwasher-safe. The lid is also dishwasher-safe (top rack only). The ceramic pot and lid are also removeable and dish-washer safe. 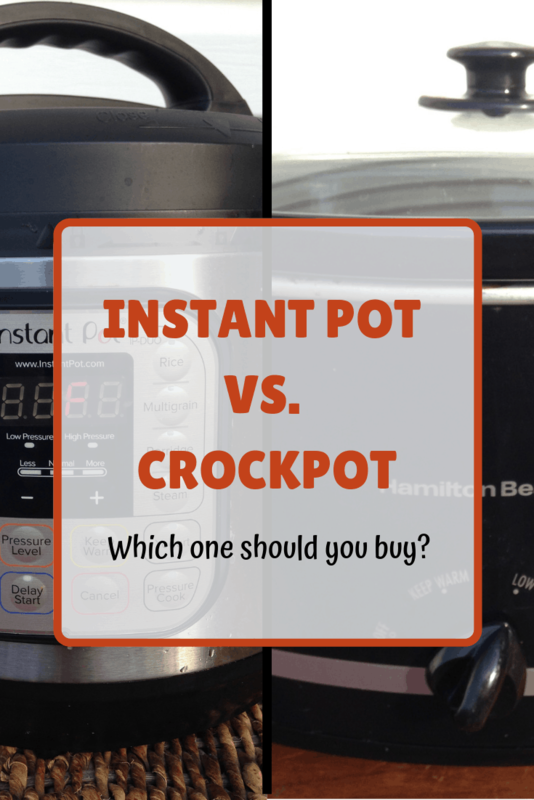 Personally, I use my Instant Pot more than my Crock Pot. I guess you could say I’m a convert. I still use my Crock Pot for entertaining or if I’m going to be away from the house all day (and if I’m on top of things enough to remember to prep in the morning!). But I only pull it out once a month or so. My Instant Pot? I use it several times a week — it sits on my kitchen counter just waiting for me to cook something yummy and fast. Let’s recap the pros and cons, though, so you can make your own decision. It has 7 different functions: Pressure Cooker, Slow Cooker, Rice Cooker, Steamer, Saute, Yogurt Maker, and Warmer. It cooks things 70% faster than a Crock Pot does. It’s saved my backside so many times when it comes to cooking dinner last minute! You can make sooooo many different dishes in it from pasta to shredded meat to cheesecake. The learning curve. You definitely have to try a few recipes before you become comfortable with it. The perception of safety risks. If you’ve seen those pictures that people share on Facebook, you know what I mean. But the Instant Pot has so many safety features — from a red button that stays up as long as there’s pressure to a locking mechanism that doesn’t let you open the lid until the pressure has completely released. It’s nothing like a stovetop pressure cooker. If it were up to me, I would convince you to buy an Instant Pot. But realistically, I know they’re not necessarily for everyone. You typically start thinking about what to make for dinner around 4:00 PM. Or you prefer not to menu-plan and enjoy more spontaneity at dinnertime. You like trying new recipes and new kitchen gadgets. It’s more affordable than an Instant Pot. Compared to the Instant Pot, it can cook fewer types of dishes. It only has one function: to slow cook. It takes longer to cook dishes than an Instant Pot. You like the idea of throwing a dish together in the morning and not thinking about it again until dinnertime. You are often running around out and about up until dinnertime and want to be able to come home to a ready-made meal. You feel more comfortable with them because your mom cooked with one — it’s what you know. You know that you’ll always worry that an Instant Pot isn’t safe. If you have a family with 4-5 people, I recommend the Duo60 6 Qt. 7-in-1. Click here to see it on Amazon. I wouldn’t pay more than $140 for it, so keep an eye out for a good price. If you have 6 or more people in your family or you feed a lot of large groups, I recommend the Duo60 8 Qt. 7-in-1. You can check it out on Amazon here. That’s the model that I own, and I love having the bigger size for when we invite people over and even for my family of 6. 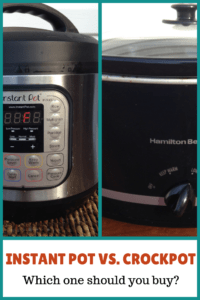 This Hamilton Beach slow cooker is what I own, and I’ve used it for a long time. It’s an 8 quart, and so it’s great for big families or groups. I use it at our annual family reunion to make chili or soup. But you really can’t go wrong with a Crock Pot brand slow cooker either. Here are the highest-rated Crock Pots on Amazon. Both Instant Pots and Crock Pots are great time-savers, so you can’t go wrong with either one. Do you own one? Which do you like better? FOLLOW ME ON PINTEREST for lots of great Instant Pot recipes and entertaining ideas! You can’t go wrong with either, Randy, but I really love my Instant Pot. It really just depends on what you’re needing it for. I just ordered my Instant Pot – should be here any day. I can’t wait – I think I’m going to be able to cook so much with it. I cook for two different diets on a fairly regular basis, so I like that I’ll do one in the Instant Pot and the other on the stove. That’s a great way to use an Instant Pot! You’re going to love it.